There’s nothing quite like a Seed weekend: a unique opportunity for families to get away from it all for an all-inclusive weekend in a top UK hotel. Gain education, inspiration and unforgettable family experiences. If you are looking further afield, we have overseas trips led by Seed’s top educators to Israel and Poland every year as well. Depending on their age, children are expertly taken care of either in a crèche or a small group with their peers. Parents relax in the knowledge that the kids are well looked after, and can enjoy their own feast of education and inspiration. The Challenge seminar focuses on the very foundations of Judaism. It is particularly designed for “thinking parents of inquisitive children” who are interested in grappling with the core components of Jewish belief. A seminar focused on family dynamics. Join friends and families for a fabulous weekend in stunning surroundings. Our fun children’s programme run by a highly motivated group of youth leaders gives you the chance to re-energise and engage with a stimulating programme of relevant classes. This weekend seminar focuses on the challenges of “raising a Jewish family”. We guarantee a unique approach combining depth and practicality, ancient wisdom with contemporary application. Just as long as they’re happy! Every parent wants their children to be happy! People think happiness and confidence is based on what we acquire and achieve. But is it really all about ice creams, cupcakes and Lamborghinis? Is this all we want for our children & ourselves? Join us for a weekend of gourmet food, meaningful discussion and great company. By the end you won’t cry because it’s over, you will smile because it happened! Our children live in a confusing and uncertain world. There are so many different paths that they could take and we as parents are responsible to help them navigate through the confusion. At Seed, we believe that authentic Judaism provides the tools to do just that. But you can come and challenge that yourself, at our Waze of Life seminar weekend. 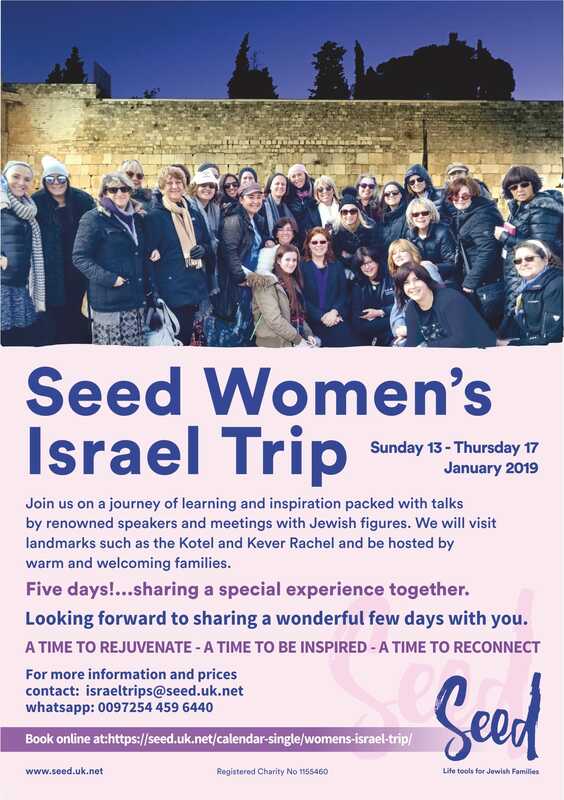 Seed are famous for their fabulous trips. We take people on a range of bespoke trips to Israel and Poland. These trips include an action-packed itinerary where all your needs are taken care of. These life-changing experiences are not to be missed! A family trip of learning, touring and experiencing Israel like never before. Click here to view to flyer. seed runs various trips across the year for men, including a learning trip to Gateshead and an overnight trip to Scotland. These are opportunities to learn, be inspired and to experience new environments and different perspectives on Judiasm and life. A mother and daughter Bat Mitzvah trip of learning, touring and experiencing Israel like never before.